TV star Abi Titmuss has told how she was "terrified" when a doctor who was stalking her burst into her bathroom as she took a shower. Dr Shibley Rahman followed Titmuss into a shower block in nurse's accommodation in 2004, a misconduct hearing at the General Medical Council has been told. Police had already warned the doctor not to contact Titmuss again. Dr Rahman is suspended pending the outcome of the hearing. Titmuss worked at London's University College Hospital from 1998 to December 2003. But she stayed in nurses' accommodation until 2004 as she attended drama school and prepared to buy a house. 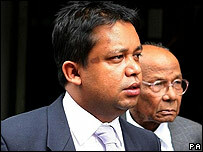 In a statement to the misconduct hearing, the star said Dr Rahman initially contacted her by letter in July 2004. "The first letter was very kind and pleasant," she said. "He seemed eloquent and intelligent." However, her statement went on to say the doctor began to ring her agent and sent "incessant" text messages. He then started to visit the nurses' accommodation where she lived. "Eventually, I had to tell reception not to tell Dr Rahman I was in," Titmuss said. The final time she met the doctor, he was at her door as she returned from a communal bathroom, the hearing was told. "I tried to get past him. He was very close to me," she said. "He started banging on the door and shouting. He was quite abusive and I told him he was upsetting me." Dr Rahman left, but appeared in the bathroom a short time later while Titmuss was taking a shower. She fled to her bedroom, where she rang her agent who, in turn, called the police. Officers took Rahman away and he was given a formal warning against harassing Titmuss again. Dafydd Enoch, representing the General Medical Council, told the hearing: "This involved a very serious course of conduct, which can only be described as stalking of a type which caused the young lady in question great distress." The doctor has admitted stalking Titmuss, named only as Ms B in the hearing, but denies misconduct. He could be struck off the medical register if found guilty of misconduct. The hearing continues in Manchester. Correction 19 August 2010: An earlier version of this story incorrectly stated that Dr Rahman was employed at London's Royal Brompton Hospital at the time of the hearing. The reference has been removed.